Google Dialogflow, Microsoft Bot Framework, IBM Watson, … The list of chatbot builders is almost endless. What makes renowned tech firms like Google, Microsoft, IBM and a host of lesser-known ones to invest in chatbot builder platforms or services? Obviously, it’s the demand from businesses. So, let’s try to find how the conversational technology contributes to the business bottom line. Chatbot is a trending technology. 47% of consumers would buy items from a chatbot according to HubSpot. Besides the real-time engagement and conversion that chatbots are capable of making happen, businesses are fascinated by the technology because it achieves the desired goals without irritating the users. Yes, marketers no need to resort to annoying and disruptive ads, spammy emails, and cold calls. These characteristics make chatbots increasingly closer to consumers and, in turn, helps businesses with increasing the conversion rate on websites and other platforms. Chatbots are expected to save banks between $0.50 and $0.70 per interaction, according to Foye, 2017. What makes chatbot operate so efficiently? Well, the secret lies in their extensive processing capability of the chatbot, which is a reflection of the robustness of the server platform of the chatbot builder platform in use. Did you know that IBM Watson is hosted on a cluster of ninety IBM Power 750 servers? Each server has got 3.5 GHz POWER7 eight-core processor, with four threads per core. In total, the system has 2,880 POWER7 processor threads and 16 terabytes of RAM. So, a chatbot can handle any amount of traffic without any downtime. Whether your users are on-the-go or at home, with chatbot development and integration solution you can reach out to them anytime anywhere. Chatbot builders are offering all sorts of APIs and resources required to make a chatbot work with wearables, phones, cars, speakers and other smart devices. Chatbot platforms by offering support to multiple languages enable chatbot developers to make talking bots speak the language of end-users. Thus, businesses can reach their target audience across the geography. For instance, Digalogflow supports 14+ languages including Spanish, French, and Japanese. With the cognitive intelligence of chatbot platforms like Microsoft Bot Framework, we can envisage a banking chatbot or website to recognize a user by his face making the sign-in a redundant thing. We can think of a chatbot to perform the content moderation and language translation jobs and even take an advisory role. This is just a brief list of what chatbots do. With the Internet and mobile getting more ubiquitous, the acquaintance with chatbot is bound to increase. 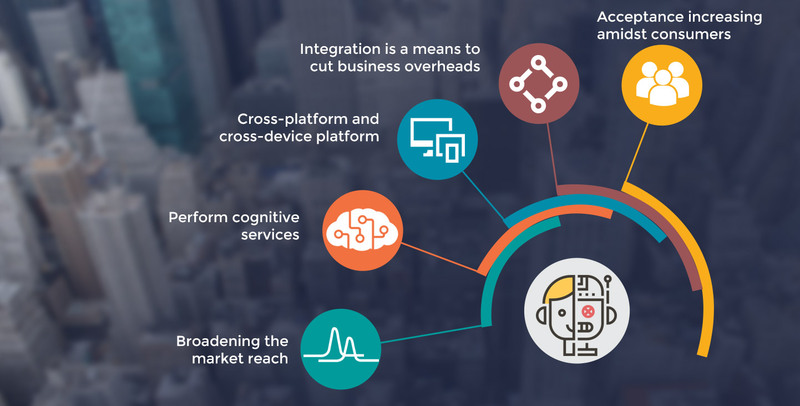 Thus, businesses that want to excel or those who don’t want to be in the list of laggards need to pay attention to chatbot development and integration to enhance their business efficiency creating new experiences for users.